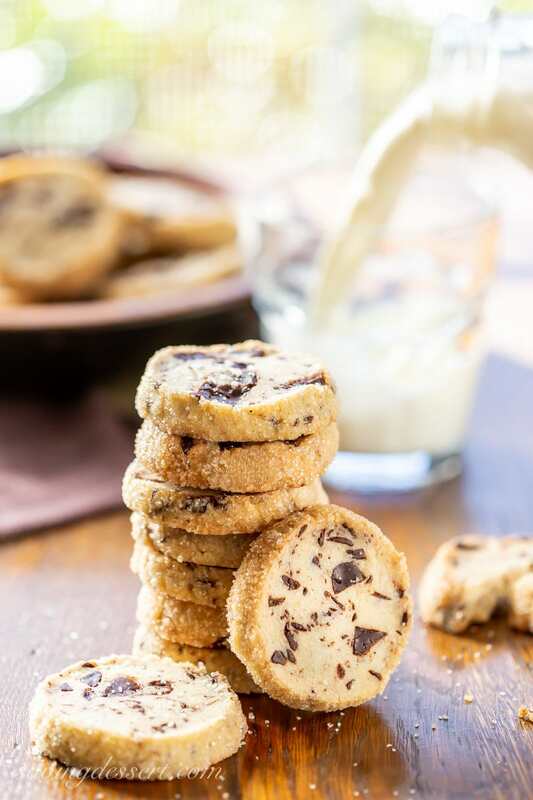 This never fail Salted Chocolate Chunk Shortbread Cookie Recipe is easy to whip up with just a few quality ingredients! 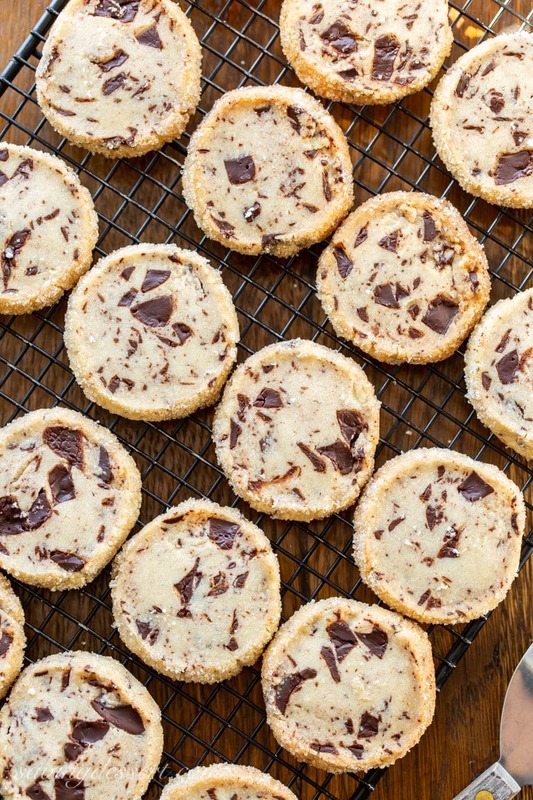 You’re going to love these delicious and easy to make slice and bake cookies. They’re so good you’ll want to keep this dough in the freezer for unexpected guests or to cure a wicked cookie craving that just won’t give in. 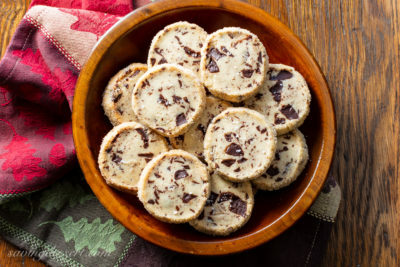 With the classic shortbread texture and a delicious buttery flavor, each bite is filled with chunks of rich semisweet chocolate, plenty of vanilla and a crisp coating of coarse sugar. The basic dough is so versatile all you need to do is peruse your pantry and experiment with delicious variations. Add a little powdered espresso to the dough for a mocha-licious treat, or substitute almond extract for the vanilla. You can also use chocolate chips if you want, toasted nuts of any kind, or toffee bits for a sweet crunch. Roll the dough in toasted, finely chopped nuts instead of sugar, they’re so good! Or, try drizzling a little simple icing on top of the baked cookies instead of rolling the dough in sugar. The possibilities are endless! I use a good quality semisweet baking bar to create the chocolate chunks. My favorite go-to baking chocolate are the Scharffen Berger brand products. Chocolate chips are pretty great, but real fine artisan dark chocolate seals the deal for me. If your grocery store doesn’t sell this particular brand, no worries. Just buy the best bittersweet or semisweet chocolate you can find. If you want to try the product I use in making this recipe, check the Amazon link at the end of this post. 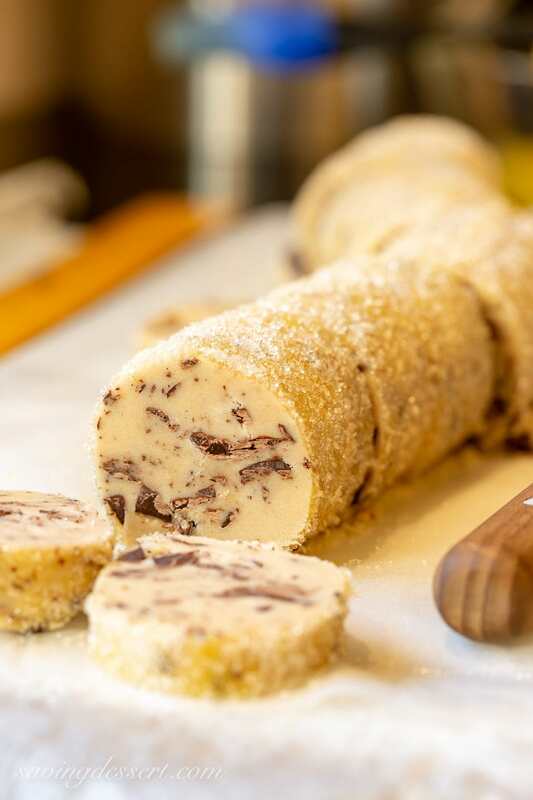 Lay a ruler next to the cookie dough log and make hashmarks with a knife at 1/2-inch intervals. This makes it easier to slice the dough into similar size cookies. When slicing the cookies, use a sawing motion if you come to a large chunk of chocolate. 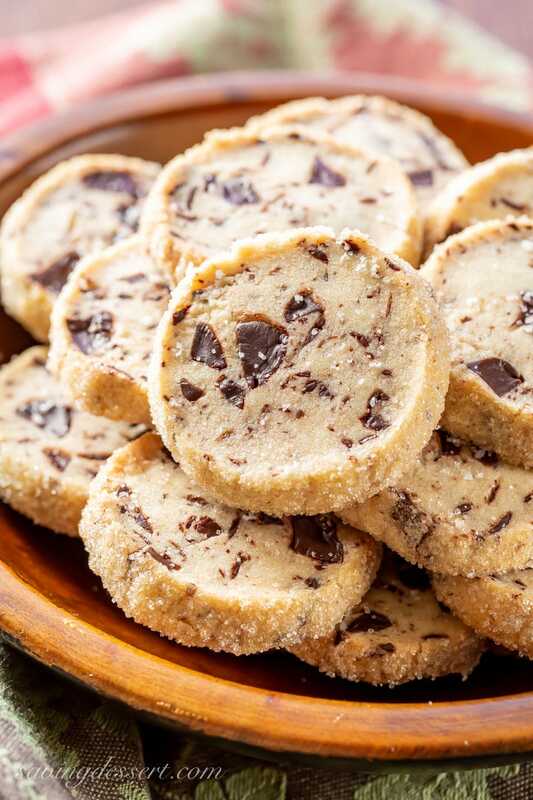 If the cookie dough splits or breaks apart, just piece it back together into a round. No worries! You can substitute chocolate chips for the chopped chocolate in a pinch, but the big chunks of rich chocolate is part of the appeal of these cookies. The cookie dough is easily made ahead and stored tightly wrapped in parchment paper and plastic wrap for up to 4 days before baking. The well wrapped dough can also be frozen for up to a month. Defrost frozen dough in the refrigerator for about 4 hours before slicing and baking. Sprinkle the unbaked cookies with a few flecks of flaky sea salt, if desired. It’s just enough to enhance the flavor of the chocolate without overpowering the cookie. 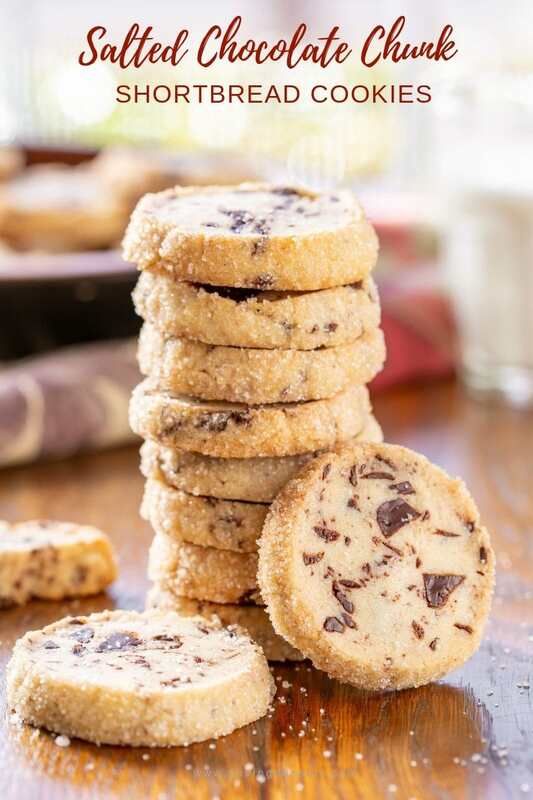 With the universal appeal of a great chocolate chip cookie and the texture of amazing shortbread, these cookies are just so darn good. Shortbread is typically an eggless cookie dough made with butter, flour, sugar and a few other pantry ingredients. One of our favorite shortbread cookie recipes is for Pecan Sandies. These perfect anytime cookies are filled with toasted pecans and vanilla beans with a crisp coating of coarse sugar on the outside. Another favorite: Pistachio Shortbread Cookies. They are loaded with buttery flavor, vanilla beans and plenty of pistachios. The inspiration for this recipe came from an email I received from The New York Times. A cookie recipe, by the same name, created by Alison Roman ranked as one of their top 10 recipes during 2018. I thought I’d create my own version and am thrilled with this final recipe. Grab a big glass of milk and enjoy! In a large mixing bowl, beat the soft butter with an electric mixer for 1 minute or until smooth. Add the powdered sugar, brown sugar, vanilla and salt. Blend on medium until combined. Scrape down the sides and bottom of the bowl with a rubber spatula, and blend again. Add the flour in four additions and mix on low speed until incorporated. The dough will seem a little dry, but keep mixing as it comes together. Add the chopped chocolate to the cookie dough and mix together using a wooden spoon, or you can fold it in using your hands. Place the dough on a large piece of parchment paper. Form the dough into a log 12-inches long and about 1 1/2-inches thick. Wrap the dough tightly in the parchment paper and refrigerate for at least 4 hours or overnight. To bake preheat oven to 350 degrees F.
Line two baking sheets with parchment paper, set aside. Remove the dough from the refrigerator while preparing the egg wash. Whisk together the egg and water. Lightly brush the entire log with the egg wash. Pour the coarse sugar down the middle of a piece of parchment or wax paper. Roll the dough log in the sugar to coat, pressing down firmly to adhere. Using a large, thin, sharp knife, slice the log into 24 (1/2-inch) rounds. Place the cookies on the prepared cookies sheets, about 1-inch apart. They don’t spread much so no worries. Sprinkle the tops of each cookie with sea salt, if using. Bake for 16-20 minutes or until the they are starting to brown on the bottom and the cookies are set. Cool on a wire rack and store in an airtight container. The butter must be very soft or the dough won't mix well and may seem dry. Don’t chop the chocolate too small, you’ll want some chunks, not just shards. Make sure to properly measure your flour. Lightly spoon it into your measuring cup and level off the top with the dull side of a knife. The dough will be too dry if you add too much flour. My favorite baking chocolate is Scharffen Berger Semisweet Fine Artisan Dark Chocolate. When slicing the cookies, use a sawing motion if you come to a large chocolate chunk. If the cookie dough splits or breaks apart, just piece it back together into a round. No worries! The cookie dough can be made ahead and stored tightly wrapped in parchment and plastic wrap for 4 days before baking. The dough can also be frozen for up to a month. Defrost frozen dough in the refrigerator for about 4 hours before slicing. This delicious, rich Fine Artisan Dark Semisweet Chocolate is perfect for our Salted Chocolate Chunk Shortbread Cookies. This 9.7-ounce bar will be a little more than enough to make two recipes. I know you’ll find plenty of ways to incorporate this superior melting chocolate for all your baking needs. Try all their baking chocolates including Bittersweet, Milk, and Unsweetened. They make incredible unsweetened Dark Chocolate Cocoa Powder too! Hi Trisha, I live in the U.K. and I have never heard of ‘turbinado’ sugar. Is it anything like granulated sugar. I would love to make these cookies if I knew what ingredients to buy. Hi Lesley – any coarse sugar will do, but if you don’t have any, regular granulated sugar will work too 🙂 Thanks for the great question. Hope you enjoy the cookies – we love them! Made these tonight. I had trouble with the dough being way too dry and I had to work with it a long time to get it to resemble a log. After refrigerating it was still crumbly and falling apart so I had to mold them into cookie shapes. And I did not brush them with the egg wash nor roll them in sugar. That being said, these cookies were absolutely HEAVENLY and worth the effort. Thank you. Hi Julie – I really appreciate the feedback. For any shortbread cookie you must start with very soft butter. Make sure you are spooning your flour into the measuring cup and leveling off the top. Too much flour or cold butter could cause these to be hard to mix. Hope you’ll try them again and add the sugar coating – it’s so good! Thanks for trying the recipe and for taking the time to let us know how it went. Enjoy! These are one of my favorite types of cookies to have in the freezer! I adore everything shortbread. Me too – thanks Susan! I love the sweet salt combination, so I know these would disappear super fast in our house ~ dangerous! Me too – soo good! I’ll never say no to shortbread. Love the stuff! And with chocolate chunks? Oh, my! Heaven. 🙂 Thanks! Thanks Jennifer. You’re going to love them! I’ve been wanting to try these out, but just haven’t had a chance! Looks good Tricia! Pinning…for me! Now you can try our recipe Anna – enjoy! 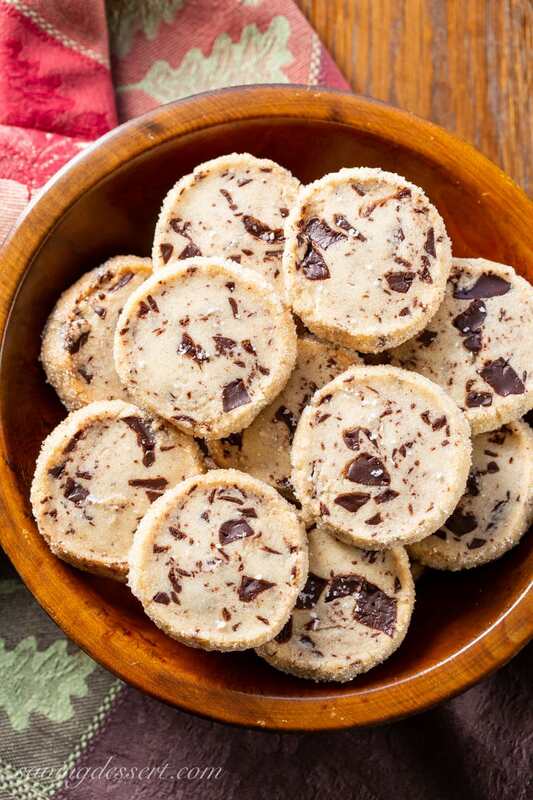 Shortbread and chocolate, what an irresistible, delicious combination! And I’m certain these cookies would cost a fortune at a fine bakery – how wonderful to be able to make them for a fraction of the cost! Thank you Chris – irresistible is a good way to describe these cookies 🙂 Have a wonderful day! Shortbread cookies are definitely on the top of my favourite cookies. These look wonderful, Tricia.